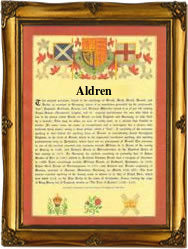 Recorded as Aldren and Aldrin this interesting surname is of pre 7th century Olde English origin. There is some confusion about the true origin of the name, which may derive from the personal name Aldwine as in Richard Aldewyne of Wiltshire in 1272. However our opinion is that it is probably topographical. If this is correct it would describe a person who lived "by an alder grove", and this seems to be proven by the recordings below. The derivation being from the words "atten - alren". Topographical surnames were among the earliest created, since both natural and man-made features in the landscape provided easily recognisable distinguishing names in the small communities of the Middle Ages. The first recording from this source of the name is possibly that of "Thomas in the Alren", who appears in the rolls of the county of Somerset for the year 1273, whilst "Henry in the Alren" is also found in the same county and also in 1273. Without doubt the most famous nameholder has been Buzz Aldren, the astronaut, and one of the team who made the first Moon walk in 1969. Throughout the centuries, surnames in every country have continued to "develop" often leading to astonishing variants of the original spelling.